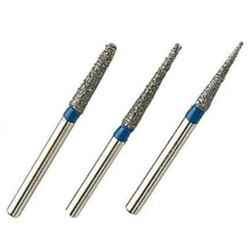 Dental Bur commonly used for both interproximal reduction and cutting in dentistry.Diamond powder is coated on shaped end of surgical steel shank for a variety of dental procedures. Superior quality used by top professionals and institutions throughout the world. Strauss give a huge variety of burs. Uniform spread of diamonds gives less vibrations and better cutting. ISO: 13485 CertifiedThe production process is Introduced in from Germany, and the diamond burs have3 Characters. 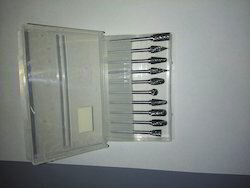 Maxima is a recognized industry leader in the supplier of dental burs, both carbide burs and diamond burs. Using research and advanced materials science, Maxima is an innovator in new dental products, dental procedures and dental lab products. 3.At 25 - 30 atmosphere, standard hand piece more than 300, 000 R.P.M. big torque hand piece more than 280, 000 R.P.M.